An Amtrak train on its inaugural run on a new route from Seattle to Portland derailed Monday morning, sending 13 of the train’s 14 passenger cars and engines off an overpass, striking five cars and two trucks on Interstate 5. 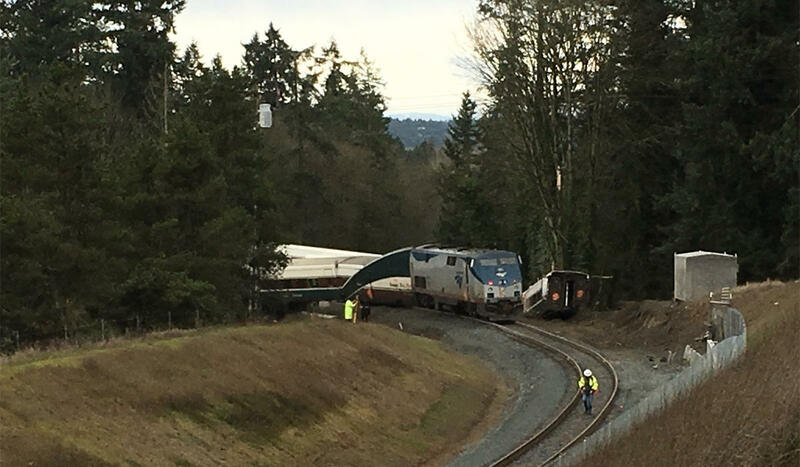 The derailment happened in DuPont, about 40 miles south of Seattle near Joint Base Lewis-McChord, at 7:33 a.m. during morning rush hour. West Pierce Fire & Rescue confirmed there were at least three fatalities. The Pierce County Sheriff’s office said multiple drivers were injured but that are no reports of any drivers being killed. According to Trooper Brooke Bova of the Washington State Patrol, the train was carrying a total of 77 passengers and seven crew members when it derailed. Personnel are still doing secondary searches and securing the scene. A view of the derailed Amtrak Cascades train looking at the rear locomotive. The train was headed south away from the camera location and derailed at this curve. The Pierce County Hazardous Incident Response Team was en route to deal with spilled fuel and batteries. Sandi Howard, from the Washington state Department of Ecology, said there was a fuel leak from the train wreck into the soil, but no fuel or contamination has reached water as of 3 p.m.. Howard said Ecology will likely go in and remove the contaminated soil after the emergency is over. 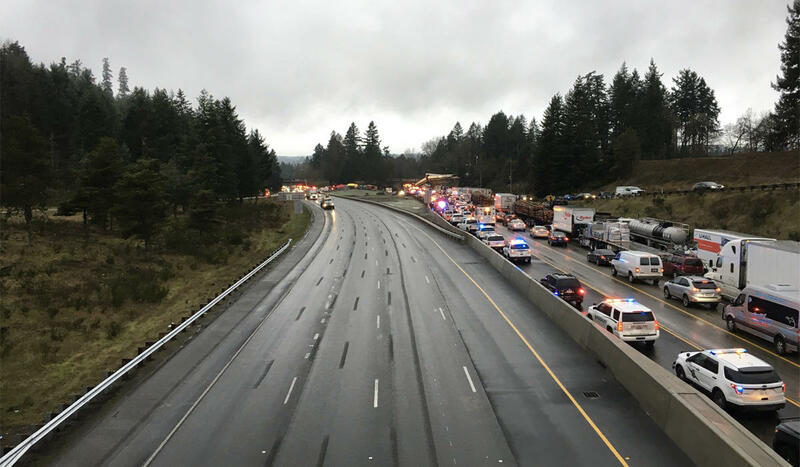 All southbound lanes of I-5 were closed south of Joint Base Lewis-McChord at Nisqually Road (exit 116), and motorists were being warned to avoid the area or take alternate routes. Washington State Patrol anticipates these lanes will be shut down for the entire day Monday. As of 12:30 p.m., officials were planning to open a detour through Joint Base Lewis-McChord. Bova said southbound I-5 traffic would be routed onto Center Street and then to SR 51. The northbound lanes on I-5 are open and moving. The State Patrol has urged northbound drivers to stay on I-5 and not to exit to try to avoid traffic. Southbound Interstate 5 gridlocked on Monday morning. This view from Mounts Road near the scene of the Amtrak derailment. Greg Mukai was driving southbound on I-5 when the derailment occurred about 50 yards in front of him. Mukai said he then saw people getting out of their cars and rushing to help. Many appeared to be military personnel wearing their uniform or morning workout gear. 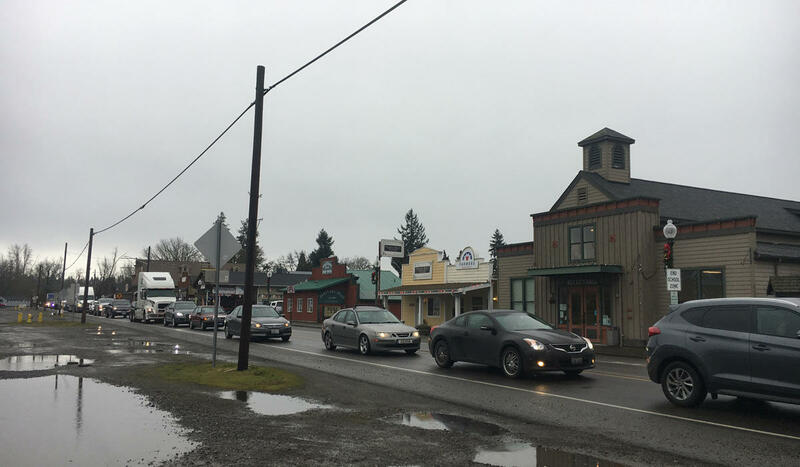 The derailment is causing major backups and delays in several small towns across Pierce and Thurston counties. Mike Gerdes, a business owner in downtown Roy, said there were huge backups there. Roy, Washington, is seeing major backups along with Yelm and Spanaway. At least six area hospitals accepted people injured in the derailment. Madigan Army Medical Center, the closest hospital to the scene at Joint Base Lewis McChord, accepted 19 patients. Seven have been treated and released, five remain in the ICU. According to a spokesman, doctors there saw a variety of injuries, many that involved blunt force trauma. Some involved fractures to the head, legs, spine and or ribs. Good Samaritan Hospital in Puyallup said they were treating 14 victims in their emergency room. At Providence-St Peter Hospital in Olympia, 10 patients arrived with non-life-threatening injuries. Three were sent to surgery, with injuries to their lower extremities.Capital Medical Center in Olympia received a total of seven patients related to the derailment. St. Joseph’s Medical Center in Tacoma received eight patients. Washington State Patrol said all non-injured passengers have been transported to their destinations. Amtrak said people with questions about their friends and family should call 800.523.9101. Train 501 is one of four trains that Amtrak added to their new route between Seattle and Portland. The new service started Monday morning. The derailment occurred on the first run of the new morning train. The route used to hug the coastline along Point Defiance. Amtrak said the new route would make travel times faster. Amtrak reports service south of Seattle is temporarily suspended. Service from Seattle to points north and east continue to operate. Southbound service from Portland is also operating normally. NTSB said it's "go team" is on the way to the scene to the scene. West Coast-based NTSB investigators were expected to arrive Monday afternoon, with the full team assembled by the evening. President Donald Trump referred to the derailment in an address Monday morning saying, "It is all the more reason why we must start immediately fixing the infrastructure of the United States."